Well, the chill is in the air. You can see it in the mornings with the frost on our cars and at the end of the day when it’s dark by 5. As much as I dislike winter, I must admit that the best part of it is the food. Fall and winter reminds me of roasts, soups and stews. At this time of the year, I love to start our dinners with a cream soup. It’s a great way to get vegetables into my children and they are extremely easy to make. However when I have time, I love to make something a little more substantial. I’ve been adding more beans and quinoa to our diets. It’s taken the kids a little to get used to it, but they are open to trying new things. I recently purchased a new cookbook called Quinoa Revolution. 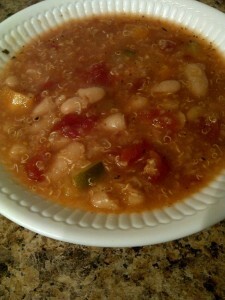 In it I found a recipe called Slow Cooker Vegetable Soup. What more could I ask for: a recipe with beans, quinoa, vegetables and in a fix-it-and-forget-it cooking method. I was sold! We had it for dinner and it was really good! Drain the soaked beans and rinse under running water. Add the beans and all other ingredients to the slow cooker. Cover and cook on high for 3 1/2 to 4 hours or on low for 6 to 8 hours, until the vegetables and beans are tender. Season with salt and pepper. Extremely easy and tasty! Enjoy!